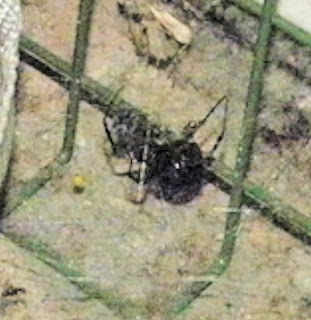 I'll try and get a better picture of my friend the Black Widow Spider They like to take up residence in homes, garages, and sheds around here. This one is in our sun room :-) You DON'T want one to bite you and we'll have to get rid of this spider (I try not to kill others). They are, however, amazingly beautiful in their own way and deserves a better picture. Good grief, I thought I had something to worry about with our little spiders here! I tried three times yesterday to leave a comment, but I'm having problems (my end I think). I don't kill spiders either if I can at all help it. I don't get people who just go around squishing them, some even seem to delight in it. But if it's one that bites or does harm, I'd have to take it out probably. We use to try an capture them in a glass jar and admire them. However, they are very poisonous, so we usually get rid of them by vacuuming them up. My younger daughter use to find them and feed them flies and bacon when she was little - so she says.